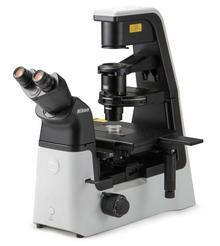 The Eclipse Ts 2R is a compact inverted research microscope that is configurable with a wide variety of observation methods. The broad range of observation methods, smaller body and improved ease of use will directly benefit research laboratories and improve workflow. In addition to conventional contrast methods, the Eclipse Ts2R features versatile observation methods, including Phase Contrast, DIC, Hoffman Modulation Contrast and Emboss Contrast. It is also compatible with a selection of high performance and quality optical accessories to function similarly to the inverted research microscope Eclipse Ti and produce clear, sharp images.